Cincinnati Reds pitching coach Bryan Price (right) signals for a relief pitcher during the second after starting pitcher Tony Cingrani (52) leaves the game injured against the Chicago Cubs at Great American Ball Park. CINCINNATI — Life is different these days for Bryan Price. 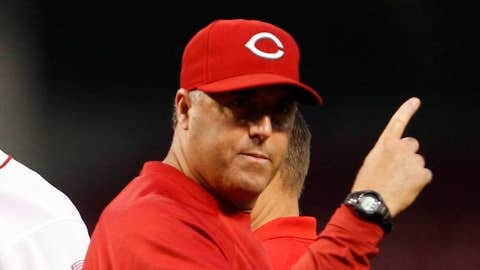 He used to have a nice little comfort zone as the Reds’ pitching coach; groom the arms on his staff, help them develop, and basically show up where and when he was told to show up. Price has a little than just some opinion on how things will go with the Reds this season. It’s now his job to guide the team past its accomplishments of the past four seasons, when three times it has reached the postseason and three times it has been bounced out in the first round. Price was named manager in October, replacing Dusty Baker who was fired two days after the Reds lost at Pittsburgh in the National League wild card game. Spring training begins in Goodyear, Ariz., on Feb. 14 when pitchers and catchers are due to report. Price hasn’t had much down time this offseason getting ready for that date. He’s had to put a coaching staff together; only three remain from Baker’s staff: Mack Jenkins has moved from assistant pitching coach to bullpen coach, while Billy Hatcher remains as the first base coach and Mark Stefanski is still coaching the catchers. Jay Bell (bench), Don Long (hitting), Jeff Pico (pitching), Steve Smith (third base) and Freddie Benivides (infield) were named in December. The Reds announced on Thursday that Lee Tinsley (assistant batting) and Sean Marohn (strength) have been added to the staff. For the first time in the past few years, there isn’t much outside excitement about the Reds. Oh, the expectation is that they’ll be good, but 90-wins good? Good enough to contend for the NL Central division title and the NL pennant? There have been no major transactions this offseason. What you saw on the roster at the end of last season is basically what you’re going to see on this season’s roster, minus Shin-Soo Choo and Bronson Arroyo. Price isn’t trying to sugarcoat this team. He admits the loss of Choo and Arroyo will be big. He has expectations that Devin Mesoraco, Todd Frazier, Zack Cozart and Chris Heisey – untapped resources he calls them – will show marked improvement in their development. He’s excited about the possibility of Billy Hamilton playing centerfield and leading off, but knows possibilities don’t come close to guaranteeing success. This team knows what it has in Joey Votto, Brandon Phillips, Jay Bruce and its pitching staff. Price has a message for all the above. The Reds started their winter caravan on Thursday, a four-day trek around a five-state region with four different bus groups made up of players, coaches, front office personnel and broadcasters making the tour and touting the team’s prospects not just for 2014 but the future as well. Price is out in front of the group. He no longer can just show up when he’s told and concern himself with his former comfort zone. He’s got a Major League club to run. He’s got a vision of what he wants it to look like.